For years in the animated Transformers series Bumblebee happily chatted alongside Optimus Prime and his human pal, Spike. But in Michael Bay's live-action movies Bumblebee has been totally silent up until last year's Transformers: The Last Knight, prompting a surprised response from Optimus. In the trailers for Bumblebee's upcoming solo film he's been quiet again, speaking through 1980s media clips since this is a prequel set in the era. But apparently that won't always be the case and we will hear him speak, and Bumblebee is going to sound a lot like that kid from The Maze Runner. I get it. Steinfeld's young, O'Brien's young, you want them to sound age-compatible, I guess? Something tells me there's going to be more to their friendship than meets the eye. 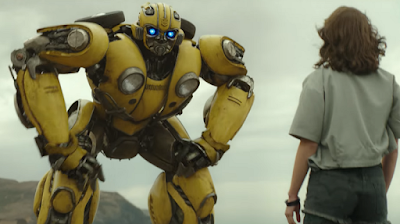 Bumblebee hits theaters on December 21st, but you can check out in an early preview on December 8th.